Simplicity 4022 – Sleeve or No Sleeve? I took a much welcome break in my work this weekend and played with Simplicity 4022. I only need to prepare and set in the sleeves and hem the top… But it turns out I’m undecided about the sleeves. When I tried the blouse for a last fitting before setting in the sleeves, Seb said it was cute as a sleeveless blouse. (the top isn’t hemmed yet and I’m not sure how long I want it to be). By the way, I am wearing it here with my new Plain and Simple Everyday Pants (by Hot Patterns). I will photograph and review those properly as soon as I get my act together and hem them! I just felt more like starting a new fun project this weekend to refresh my mind. Of course, I could (and would definitely) layer the top even if it had sleeves. But the sleeveless top might be more versatile. Personally, I love the bell sleeves and am still thinking adding them might be the best option. I’m thinking the top would be classier and more distinctive with the sleeves. But Seb’s remark made me waver, so I would be interested in your opinion. PS: I took these pictures with my self-timer, and used a tripod for the first time. My tripod is my new best friend! I voted for sleeveless! You will love your tripod!! Hooray for the tripod! But I can’t help you on the sleeves. 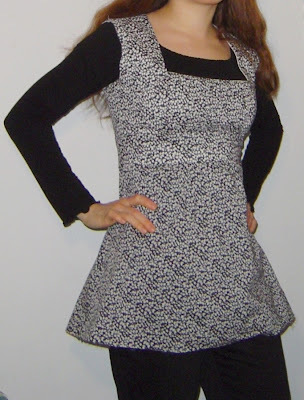 Yes, the top is cute without them, but you started the pattern because it had cute sleeves. Glad to see you back at your lovely sewing. I too like it without sleeves and it looks good when layered. Whatever you decide it will look good on you. Very cute! You’re right, I definitely love the sleeveless version best. The sleeves are cute, but I like the sleeveless version better, especially layered. Hope Seb? is better soon. I like it sleeveless better. More layer options that way! I think that as you have the fabric for the sleeves and YOU would like the sleeves, do the sleeves. Then get some more fabric to make a sleeveless version….and everybody wins! I think the sleeveless is nice too, however you “seem” to be thinking/wanting sleeves 🙂 so I would go with sleeves and make another one since it’s such a nice style;) The fit is perfect and the pants look really good too. I love black and white outfits. I think you look fabulous in it with no sleeves. Whatever you decide, I’m sure it will look adorable on you!! I like it without sleeves best.You should find more fabric & have one each way. They will look quite different. I love the square neckline. Well I voted for sleeves…guess I just gotta be different! I voted sleeves, I just really like the look of them. Good luck deciding. It just looks great, I like it sleevless. I can’t decide, I think it would look lovely either way. Guess that means you might need to make one of each LOL.I hope whoever is ill feels better soon. J’aime les deux versions, alors ce n’est pas facile de te répondre… Dans les deux cas, ce sera très réussi 🙂Je pense très très fort à toi et te fais de gros gros bisous. It looks like your vote is pretty evenly split! Me, I voted for sleeves…and then you can make another one sleeveless for summer LOL! I think I’d like it better with the sleeves. But either way I’m sure will look cute. Sans manche!! !mais l’autre est joli aussi.. mais non, je reste sur ma position: sans manche. D’autant plus que ça te permet de le porter de 2 façons. C’est aussi très joli avec un dessous noir.ce tissu est vraiment très joli.Nous pensons fort à toi.Je t’embrasse. I like it very much without sleeves and layered over another top. But… I bet those bell sleeves will look great on you (don’t know why but they really are your style, in my opinion) so I vote for making another top with bell sleeves and keep this one sleeveless. Hello ma chère Isabelle !Ce soir, c’est version en français et sans manche pour moi, please … En fait, je trouve le modèle avec les manches vraiment joli, d’esprit très romantique, mais sur toi, et avec ce joli décolleté carré, le sans manche me plaît encore plus ! Du coup, il ne te reste plus qu’à en faire deux, un pour ta garde-robe printemps-été, et l’autre pour ta garde-robe automne-hiver !Bravo pour tout ce que tu réalises, c’est magnifique !Gros bisous et à bientôt ! I voted for “with sleeves” but I DO like it without also. 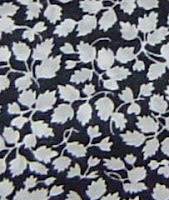 Since I know how expensive liberty fabric is, and I’m guessing you have just enough for the sleeves, I would add the sleeves to this version, and make another sleeveless. I think that the contrast with the dark top layered underneath is what many of us like also, so . . . I’m going to suggest you add some dark trim a la the pattern envelope. JMHO.